Speeding is one of the most dangerous driving behaviors across our Illinois roadways. In fact, according to the National Highway Traffic Safety Administration (NHTSA), speeding contributes to about one out of three fatal accidents and is the third leading cause of traffic crashes. Have you or someone that you love suffered physical or property damage after being involved in an accident that was caused by a speeding driver? At The Tapella & Eberspacher Law Firm, our auto accident attorneys believe that if you or a family member has been injured due to the negligent actions of another driver while speeding, the victim may be entitled to compensation for their losses and damages. Our attorneys will seek the maximum compensation for these individuals and guide them through the entire litigation process. To learn more, call us today at (855) 522-5291 or complete our Free Case Evaluation form to the right of this page. We offer speeding accident victims free consultations and we only get paid when we win. 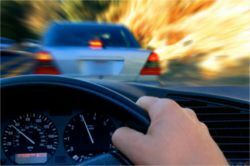 Surveys conducted by the National Highway Traffic Safety Administration show that most people find speeding as a threat to their safety, while many of them also indicated that they speed when they drive. The NHTSA has also identified several reasons individuals may decide to speed. As we can see, these are all forms of negligent and ignorant driving. Many of these individuals fail to realize the repercussions associated with this driving behavior and must be dealt with accordingly. Our attorneys advise all individuals to abide by the rules of the road and practice defensive driving habits at all times. Unfortunately, most drivers fail to recognize the significant results which can occur from speeding. As a few of the reasons for speeding are listed above, we must take the habits of these individuals into account while we are driving in order to protect ourselves. These results are impossible to ignore and must be reduced in order to make our roadways safer and more enjoyable. Of course, many drivers will continue to speed and continue to add to the number of fatalities that occur each year. These individuals will also contribute to more accidents and injuries as well. Injuries which are caused by speeding are typically more severe due to the increased force that these accidents create. As with any type of injury, the more force applied will typically result in more severe injuries. Of course, when an automobile is traveling at 70 miles per hour versus an automobile traveling at 40 miles per hour, one can imagine the differences in injuries associated with the accident. If you have been involved in an auto accident, it is imperative to seem immediate medical attention for your injuries. This medical attention will assure all of your injuries have been properly cared for and prevent further damages from occurring. It will also provide our attorneys with an additional source to help prove these injuries were caused by the negligence of another individual or entity. At The Tapella & Eberspacher Law Firm, our attorneys understand the struggles and devastation involved following an auto accident. Thus, we would like to assist you in seeking justice for your injuries and helping you recover without having to worry about finances. We will seek the MAXIMUM compensation benefits while guiding you through the litigation process from start to finish. With our main offices located in Charleston and O’Fallon, Illinois along with St. Louis, Missori, we are able to assist clients throughout both states and elsewhere. … and many other surrounding towns and cities. Our law firm is proud to assist auto accident victims and welcomes you to contact us at 855-522-5291 today for more information. Furthermore, our attorneys all operate on a contingency fee basis, so we will not get paid unless you get paid. Begin here by completing the Free Case Review form on this page. It’s completely free and confidential.